CES 2011 brings a slew of new cases for the iPhone 4 from all the known and yet to be known case companies. 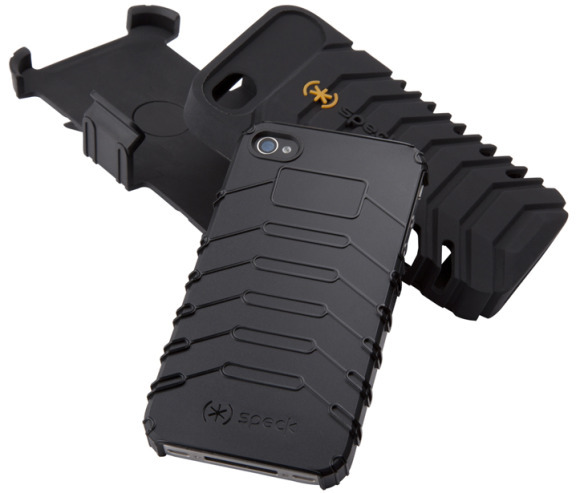 Today Speck introduced to us a few new iPhone 4 cases including the new and much tougher, ToughSkin case which is a hybrid case with an opposite way of layering the hard and soft layers of the case featuring a textured rubber outer layer for grip and a hard shell inner layer. The ToughSkin will also come with it's own detachable holster with a rotating belt clip that also doubles at a video stand. The ToughSkin case will be available in black for $39.95, ouch that's pricy, and will be up for grabs this January. Next in line Speck introduced their new ToughShell case for the iPhone 4 that will retail for a whopping $49.95, Speck calls it their toughest case yet. The ToughShell features a three-layer rugged protection including shock-absorbing rubberized insulation, an impact-resistant plastic hard shell and a textured silicone perimeter grip band designed to help seal the case and offer added grip. Like the ToughSkin, it also includes a detachable holster with a rotating belt clip and also doubles as a video stand. Expect the ToughSkin later this month.